Most of the time, a Supreme Court ruling has its intended effect of being the final word on laws, be they good or bad. On some issues, you can count on the defeated side looking for a way around the decision. 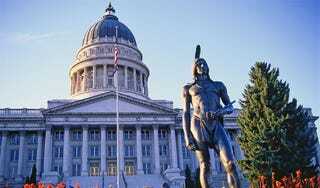 The Utah state legislator behind an anti-games bill says he won't pursue it in light of Monday's high court ruling, though he seems to have arrived at that choice grudgingly. Morley thinks his bill would have been found constitutional had it become law and been challenged. Though it was vetoed, Morley and a conservative political group have kept the issue alive. But he doesn't plan on pursuing it in the Utah legislature any more. "It's not on my radar to fight that fight," Morley said. The law was vetoed in 2008 by then-Gov. Jon Huntsman; its constitutional sketchiness and the expense of litigating challenges to it were cited as reasons for its rejection, though Huntsman also noted the damage it could do to local businesses, games development in the Salt Lake area, and to principles of free expression.